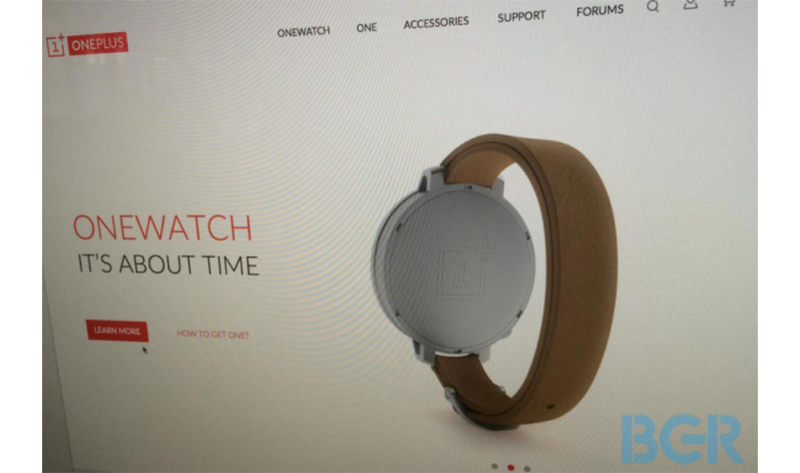 A photographed screenshot taken from the OnePlus website, leaked by BGR India, shows off what could be the startup company’s next project – a smartwatch. Given the name OneWatch, it is still unclear whether this device is even real, let alone powered by Android Wear or a CyanogenMod build of something else. What is apparently known are the materials the device is made of, as BGR India was also able to scoop up design sketches of the hardware, which show off an OLED display, “Saphire” glass, Qi wireless charging, configurable crown button on the side, leather bands, curved battery, and a titanium exterior. If it is real, it looks kinda hot. There are two things that lead us to believe this could just be a troll, though. First, “Saphire” is spelled wrong. Sure, everyone makes mistakes, but usually designers and engineers know how to spell out components they are using for a device. At least, I would hope so. Secondly, the last time a leak came from a “screenshot of the OnePlus website,” it was found to be a hoax. We know OnePlus has been the source of controversy in the Android community lately, seeing as how you can’t exactly purchase their phone, but if the startup OEM was to announce a smartwatch, possibly based on Android Wear, would you be interested?